Phillip N. Ward, a Graybar sales rep, shows the CARA board how the proposed fixtures throw light down and not up. Albany likely will use urban renewal money to light the Dave Clark Trail on the Willamette River along with a portion of Monteith Riverpark, where the path starts. But exactly how or when it will go about it is still unclear. 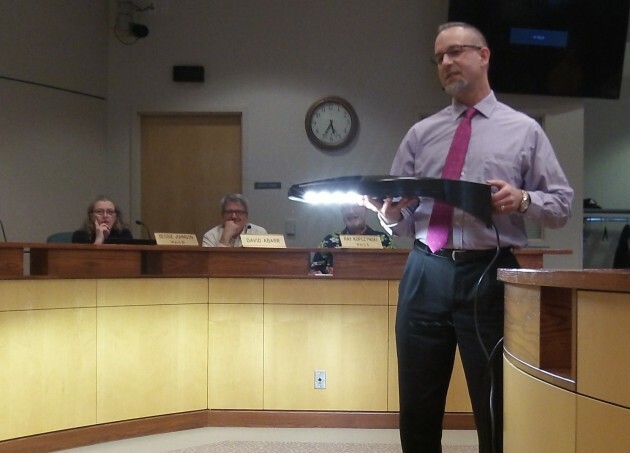 City councilors and other members of the Central Albany Revitalization Area advisory board on Wednesday unanimously endorsed the idea of spending CARA money to install the path lighting and replace some lights in the park. At their next meeting on April 15 they expect to get a detailed proposal from the city staff on how to get the job done. The choices are whether to hire someone to design the lighting system and call for bids, or to go with a proposal to buy the fixtures from the Graybar company and have them installed by Benton Electric under the U.S. Communities Government Purchasing Alliance. Albany belongs to the alliance, which buys goods and services based on group bids. Graybar and Benton Electric put together a proposal for the path lighting that calls for 94 16-foot poles (set on 2-foot bases for a total height of 18 feet), 72 fixtures of one kind, 22 of another, plus four wall fixtures and one for a restroom. Total cost would be 9,245, reviews including $179,227 for installation. The light-emitting diodes are good for 100,000 hours, which means about 12 years of operation. Sandy Roberts, community education specialist with the Albany Police, presented the proposal to the CARA board. She had earlier told the council about environmental design to discourage crime. When she was asked to work on the parth lighting, she enlisted the help of Graybar and Benton Electric because the city has no employees who are electrical engineers. The lamps would be tall enough to be hard to vandalize, and they would throw light along the path but not off it or up, as the few existing lights now do. The point of the whole thing is to improve public safety and thus encourage more people to use the trail, all part of an effort to support existing business and encourage new investment in that area. A quick calculation shows the poles costing about $2800 each. A quick google search on how much poles cost, shows that this is in the ballpark (some reports higher, a few a bit lower). This is going to city improvement. So I’m good with this decision. CARA uses Tax Increment Financing (TIF) to fund the city council’s pet projects. This means CARA will put Albany residents millions of dollars into debt without voter approval by issuing urban renewal bonds. CARA then spends the bond proceeds on pet projects. The theory behind TIF is that today’s spending will increase future property tax revenues above that which would have occurred without the subsidy. Of course, nobody knows the future and nobody knows what private spending would have happened anyway on its own. But the CARA folks apparently have a crystal ball and can read the future. The theory becomes very abstract when the pet projects are public improvements, meaning the improved property generates no property tax revenue (like the Trail, in this case). The theory asserts that privately-owned properties within the CARA district will increase in value enough to justify the “investment” in the lights. That’s the theory, anyway. Now…enter the hard reality where theory doesn’t operate. To pay the bond principal and interest, CARA must skim property tax revenues away from the other taxing districts. This means money will be taken from essential services like police, fire, sheriff, jail, library, parks, education, and 4H. That money effectively pays for these trail lights. We sacrifice essential services for CARA’s pet projects. As a property taxpayer, I object to having CARA skim my property taxes away from their intended use to fund trail lights. For example, I paid my taxes to the sheriff’s office to provide law enforcement and a jail in the county. I didn’t pay my county tax for CARA projects. Every time CARA skims tax revenue away from its intended use a breach of faith happens with the taxpayers. At its core, CARA is immoral. If the city wants these lights, let this project compete for funding from the city’s general fund. At least then we can have an honest debate about city spending priorities. Do you have an ORS citation and a city ordinance number/date to verify what Marilyn asserts? Did she mean bonds? The council passed a resolution stopping CARA from skimming off bonds issued by the taxing districts. But bonds are different from operational levies. According to the county tax assessor website reports, CARA continues to skim from the levies. I believe you are referring to HB 2632 which passed in 2013. That law stopped CARA from skimming local option levies that voters approved after Jan 1, 2013. But CARA will continue to skim from local option levies that voters approved before Jan 1, 2013 and CARA will continue to skim from a taxing district’s permanent rate. The above information doesn’t change my point one bit – CARA will continue to skim taxes that were intended for a different purpose. That is immoral. In a subsequent email, city spokeswoman Marilyn Smith clarified that the 2013 Legislature passed HB 2632, which excludes local option taxes approved after January 1, 2013, if the urban renewal agency files a certificate with the county assessor forgoing the share of the local option levy it otherwise would receive. The Linn County Sheriff’s levy was renewed in the May 2014 primary. Urban renewal manager Kate Porsche reported at the May 6, 2014, CARA meeting that she had delivered a letter to Linn County that day to confirm that ARA would no longer take those funds and fully supports the new law. The amount that would go back to sheriff’s office was $325,000. I just checked the SAL Report, Table 4e, dated Oct 2014, at the assessor’s website. It shows CARA skimming the following amounts. Not sure what Marilyn is referencing. Perhaps she will provide more detail to you.